Roger Leister was born in Hanover, Pennsylvania, on 22 September 1923. His parents were Edgar R Leister and Helen Marie Rebert. In school he was known for being athletic and an above average runner. As a child growing up he always dreamed of flying an airplane. When the war broke out he was too young for the draft but his parents consented to his joining the Air Corps after he turned eighteen. Come June of 1942, Leister went to Baltimore and passed the test for the Army Air Corps Cadet Program. He was sworn into service on 25 June 1942 but was not called to report for training until December. During his waiting time he got engaged to his girlfriend, Dorothy Mae Walton, better known as Dottie. Roger Leister reported to Baltimore on 22 December 42. From there he was shipped off to San Antonio, Texas. After passing more examinations, he was accepted for pilot's training. His initial training began right there in Texas but soon he was attending a number of schools and Officer Candidate School in Altus, Oklahoma. He was commissioned as a 2nd Lt on 2 November 43. After graduation he was sent to B-24 training in Liberal, Kansas. Then he went to Salt Lake City, Utah, where he was assigned his crew. They began their combat training in Casper, Wyoming, on 6 March 44. Upon completing their course in May, in was decided to have them go through additional training at McCook, Nebraska. The unexpected transfer to McCook messed up Roger and Dottie's wedding plans made earlier, so Roger sent her a telegram proposing they get married in Nebraska. They were married at the base chapel on 28 May 44. On 7 June 44 Leister was on his way to war. They flew a replacement aircraft to Ireland via the Northern Route. After more training in the ETO, the Leister Crew was assigned to the 466th BG. Upon arrival on 9 July 44, they were told not to unpack because they had been reassigned to the 492nd BG. After arriving to North Pickenham, the Leister Crew quickly found out why the sudden change in their assignment. This group had been suffering heavy losses and needed replacements in a hurry. They were assigned to the 859th BS since it recently lost an entire squadron formation. The crew's in house training was short as they began flying combat on their eighth day. Lt Leister led his crew on nine missions before the Group was disbanded in early August. On six of these, they came back on less than four engines as the flak continued its toll on the Group. They felt fortunate to had survived the Hard Luck Group as their new orders sent them to the 467th BG. By mid August, they were flying combat again. This time his squadron was designated as the newly organized 788th BS, which was nothing short of the old 859th with a new number, airfield and group commander. Leister led his crew designated now as Crew #8 on two missions but the second one proved to have the old 492nd luck. They lost two engines to flak over the target in France. They managed to limp back across the Channel but soon after reaching land, they lost a third engine. They were forced to crashland in an empty field bordering Kirby Bedon, UK. Four men were killed and another was severely wounded and sent home to the US in a body cast. Leister was hospitalized with one hundred stitches in his head, but nothing was broken nor did he suffer internal injuries. The remaining three men were also wounded but treated and released to ground duty. Upon recovery, Leister was given his choice as to go back into combat or take a ground job. He chosed combat and was given command of Lt Sims' Crew #6. Before getting back into combat, the group was stood down in order to fly gasoline missions to General Patton's troops. Leister flew eight of these before getting his new crew. Leister led his new crew on missions until they reached their completed tour of thirty-five. Since Leister was still short, he was given command of Crew #19, which was a make-shift crew of orphans from other crews. 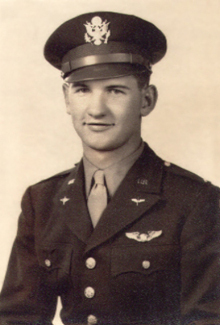 Rather than going home, Leister became an instrument instructor for the 467th teaching blind landings and took his turn flying the formation assembly plane. Three days before the end of the war in Europe, on 5 May 45, Leister was on a boat headed home. After landing at Fort Dix he was given 45 days leave before reporting to Miami. Shortly after arriving to Florida, he won a lottery, sort of speak, which granted him early seperation from service. The funny thing was that his paperwork got messed up and he did not officially receive his Honorable Discharge until the summer of 1990. For the next few years Leister worked at a shoe manufacturing company but left that to go in business with his brother Ken. They founded Leister Furnature Company which proved successful. After co-running it for 40 years, Roger retired and began a new hobby of traveling with his wife. Roger and Dottie have raised three daughters; Susan, Linda and Joanne. Dottie, who did volunteer work as a Gray Lady at the hospital, got Roger involved too. When she passed away in 2001, she had given them 47 years of service. Roger continues donating his time which as of 2006, he has put in 22 years. Roger Leister is proud to say his family is patriotic and has served America during the 20th century very well. The list below begins with his father and ends with his grandson's tour in Kuwait and Iraq. Roger Leister passed away on Wednesday, the 13th of August, 2009. A memorial service will be held at 1:00 pm Saturday, August 22, 2009 at St. Mark Evangelical Lutheran Church, 129 Charles Street in Hanover, PA.